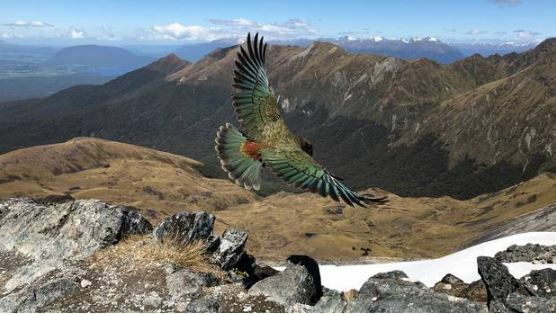 An American tourist has captured a "once in a lifetime" photograph of a flying kea on the Kepler Track in Fiordland. Californian man Phil Narodick was on a two week holiday with his fiance when he came across a curious and inquisitive kea swooping in around Mount Luxmore. "I was hiking the Kepler Track with my fiance and we had spent our first night at Luxmore Hut which is above the treeline. We were warned about the kea and not to feed them," Narodick told the Herald. On the couple's second day up Mt Luxmore they veered off the track to have lunch at the peak of the mountain overlooking Fiordland. Their lunch date was soon interrupted by a beautiful kea, who kept trying to steal the couple's food. "We were eating lunch and this kea came up to us and kept trying to peck at our food and steal our lunch. "It would come in and try to make a run for the food. I'd have to wave my hands to try and scare it away, but it kept coming back for more. "When it flew away it looked so beautiful that the next time it came back I whipped my iPhone out and started taking pictures of it and managed to get one that was amazing." Narodick says the kea kept them company for about 15 to 20 minutes before it flew away. The 33-year-old's up-close and personal interaction with the kea was one of the best moments of his life. "My fiance was happy I spent more time focusing on the kea than her," he joked. "It was the best trip of my life. The Kepler Track was the best part of the trip. The views were unparalleled." The kea is a native New Zealand bird that is found in the forested and alpine regions of the South Island. The native bird is nicknamed the "clown of the mountains" as they are notorious for exploring humans' backpacks, boots, and equipment while in the mountains. Narodick says it won't be the last time he visits New Zealand an encourages Kiwis to explore their own backyard. "I was blown away. I've been saying to friends since I've come home I can't recommend New Zealand highly enough. "You live in such a beautiful country."